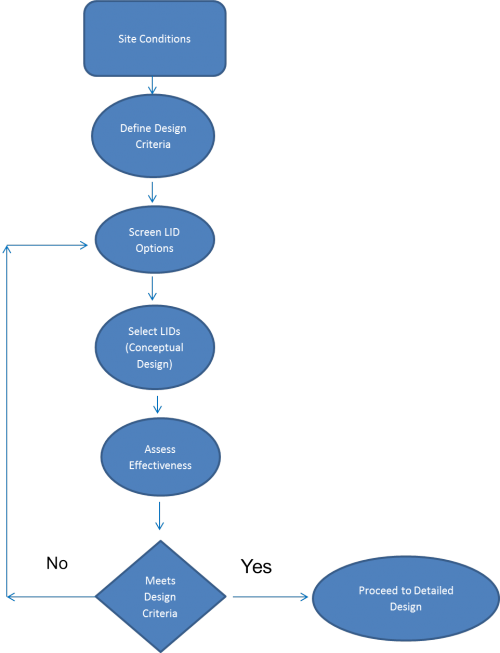 This guidance article intends to help reduce the number of LID options in the preliminary phases of design and to alert the designer to LID opportunities unique to the site-type being assessed. When going through the process of screening LID options, it is important to have a larger contextual understanding of Integrated water management, Site design strategies, and Siting and layout of development. Complete definition of pre-development site conditions is essential prior to screening of potential stormwater BMPs. 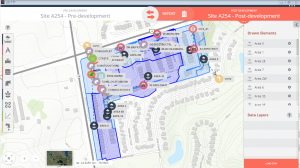 The designer should prepare maps describing site conditions and identifying all environmental features and functions that need consideration in accordance with provincial, municipal and conservation authority development regulations. This includes watercourses and small drainage features, floodplains, important recharge areas, steep slopes, wetlands, natural heritage conservation areas and significant wildlife habitats. In addition, information regarding native soil types, infiltration capacity and depth to water table must be determined. When attempting to apply stormwater BMPs within a development site, give careful consideration to site conditions and constraints. See this handy table for and outline of the factors constraining the use of each LID BMP. Further information regarding constraints to the design of various end-of-pipe BMPs can be found in the Ontario Ministry of the Environment Stormwater Management Planning and Design Manual (2003). Before resorting to end-of-pipe BMPs, evaluate whether LID BMPs can meet the design criteria. Resources for evaluating LID practices within Ontario can be found at Sustainable Technologies Evaluation Program (STEP) and Credit Valley Conservation's LID Monitoring program. For a global perspective on LID performance across various geographical regions, check out the International Stormwater BMP Database. Performance data can be downloaded or uploaded and statistical analysis tools are provided. The LID Inspection and Maintenance Guide is intended to assist municipalities and industrial/commercial/institutional (ICI) property managers with developing their capacity to integrate LID BMPs into their stormwater infrastructure programs. Part 1 of the document provides guidance on designing an effective LID BMP inspection and maintenance program, based on experiences and advice from leading jurisdictions in the United States, adapted to an Ontario context. Part 2 of the document establishes standard cold climate protocols for inspection, testing and maintenance of seven types of structural LID BMPs. The Low Impact Development Treatment Train Tool (LID TTT) is designed to help developers, consultants, municipalities and landowners understand and implement more sustainable stormwater management planning and design practices in their watersheds. The LID TTT is built upon the open source EPA SWMM5 model providing a user-friendly interface for novice modelers and cross-compatibility with SWMM5 for further model development. The LID TTT has been developed in partnership between Lake Simcoe Region Conservation Authority, Credit Valley Conservation, and Toronto and Region Conservation Authority. This links to the project page, where you can download your free copy of the LID TTT.